The latest kitten naming rights auction just went live on Ebay! 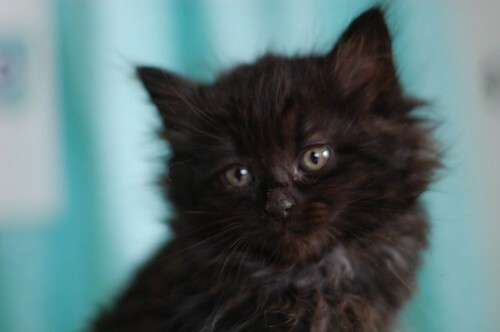 First up today, is our floofy black kitten. Later this afternoon, we'll post another one of the Suprenant Sisters. If you would care to take part in action, click HERE. The auction will run for 3 days. And don't forget, if the bidding goes beyond your budget, you can always make a donation to the fundraiser, which automatically enters you into a raffle. The prize is naming rights to one of our kittens from the next litter (and a selection of IBKC cards too) ! To visit the auction... click HERE. To make a donation, and enter yourself into the raffle... click HERE! She's so beautiful and kinda exotic. If it were up to me I'd name her Nina Simone Suprenant! Aaawww, I wonder if this is what my Cleopatra (RIP) looked like when she was a baby kitty. Over $100 now! Go kitten!